There is a trail that goes from Oregon Gulch to Fox Creek, which is right across the street from Carol's house. We decided on the shorter one, which is only about six miles I would guess, ending with a big solid bridge over the Big Wood River, which is rushing by at full force. The trail is shady and cool, following a route through the forest and then a climb up over a ridge line. There were a couple of tiny water crossings but it was mostly an easy ride for Arizona. Roy and Smartie were along for company. For the first half we didn't see a soul. It's days like this that fill my heart, refresh my mind, the scent of pine and a cool breeze now and then and the sun peeking down at us through the tall branches. As we neared Fox creek we started to run into hikers and bikers, which were no big deal. 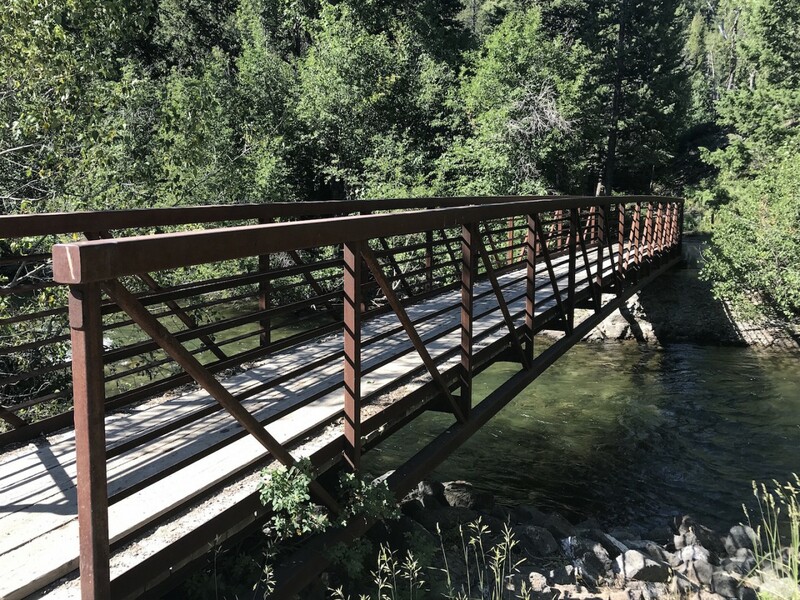 For years this trail had some skinny little bridges that were very technical for a horse to cross, but they were washed out and instead of rebuilding them, the trail crews just rerouted the trails. At the end, rounding a corner, stood the big bridge. "You ready?" David said. Roy walked up onto the bridge. At the sound of Roy's hooves on the bridge, Arizona hesitated. I gave him a little squeeze and he cautiously stepped on, trusting me, trusting Roy. Clomp clomp clomp the two horses made a lot of noise on the wooden boards. Arizona was tight as a drum but this bridge has good tall strong sides, so where could he go? Carol and Smartie waited to follow, since that sound behind a young horse can be very frightening. The energy from the water roaring by below us seemed to bleed up toward us on the bridge. At the half way point he stopped, legs splayed a little, body trembling. I petted his neck, squeezed just a little with my legs. "Come on, honey, it's okay." He kept going to the other side. Like he's done before, he shook his head once, and calmed right down. Carol followed. The last obtacle was the highway. Highway 75 is the main road that comes up from Twin Falls, and runs right through Ketchum to the Sawtooth Basin. It's a spectacular drive and very busy in the summer months, with motorhomes and campers and trailers stacked with mountain bikes. We stood at the side of the road, waiting for an open spot. He was nice and still. We walked along side of Roy across the white stripes on the road and there we were, at Carols. Her big pasture is leased out to two pack horses for the summer and as we rode around to the gate at the back of their pasture, they barely lifted their heads from the lush grass. These two were the biggest concern of the day for Arizona. He was fidgeting around under me, tossing his head and not paying much attention. We rode through the pasture and managed to open the second gate horseback, Arizona had one eye on the big horses as they slowly made their way toward us to investigate, but stood still. On the other side, as David was shutting the gate, we waited, (as is the proper etiquette), when Arizona started kicking and jumping around. "Okay, you need to move? Let's go." We just walked and trotted around in a couple of circles, left and right, my legs cuing in sync with my hands. I think he had flies bothering him and these big horses were coming over, and who knows what else was concerning him, but he got over it and the three of us walked over to the hitch rack and that was the end of our day. I was very proud how he handled that bridge. I am thrilled at how fast he is learning about the mountains and all of the delights and challenges. 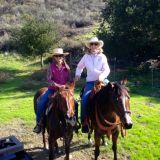 We dropped our saddles next to the pasture they're in and as Carol drove David back up to pick up the truck, I brushed them down and checked their water. It seemed I could almost hear their conversation, Arizona asking Roy about that big bridge, the highway, and those huge horses in the field.